March 17, 2011 by Cary H.
As interesting as it can be to process a large collection of papers from an individual or organization, I find processing small collections just as satisfying, if not more so. 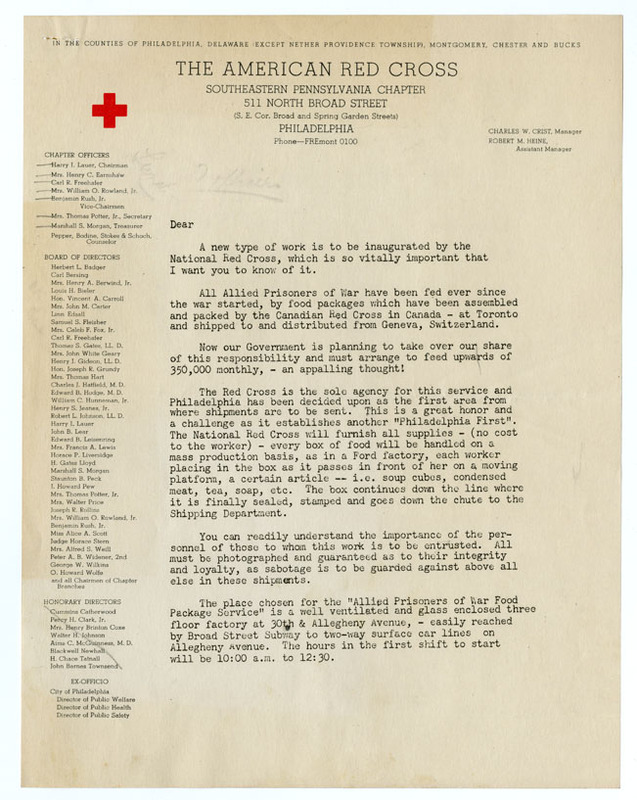 It’s true that small collections can be difficult to process since sometimes there’s not enough information in them to form coherent background or scope notes, but that’s not the case with the Mrs. Stacy B. Lloyd papers on the American Red Cross’s Allied Prisoners of War Food Packing Service. We took in this 2-box collection last year, it was adopted by the donor, and onto my processing list it went. 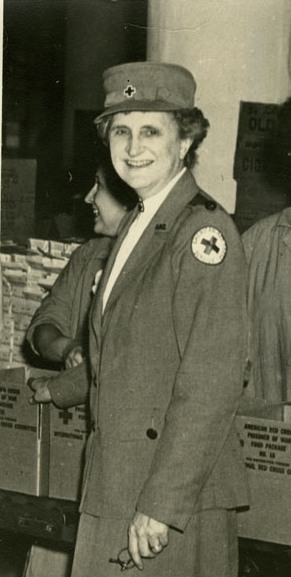 Mrs. Lloyd became the director of the nation’s first American Red Cross Allied Prisoners of War Food Packing Service, which opened at 30th Street and Allegheny Avenue in Philadelphia on February 1, 1943. 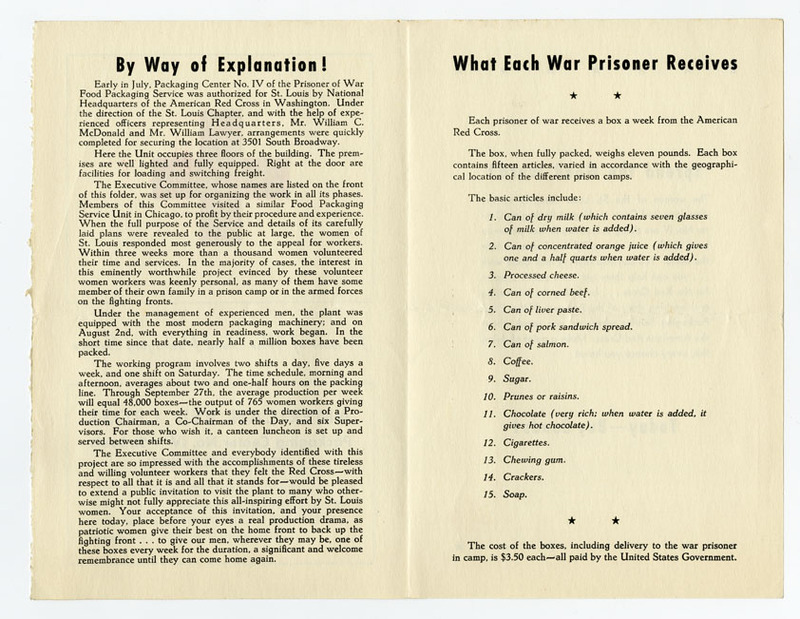 From early 1943 through the end of the war in 1945, Lloyd supervised hundreds of mostly women volunteers as they created care packages for Allied prisoners in war camps in Europe and Japan. In the thirty or so months that the Philadelphia packing center existed, its workers sent over a million prisoner of war food packages. Recognizing her dedication to the cause, Mrs. Lloyd received the Gimbel Award for “America’s outstanding woman” in 1944. 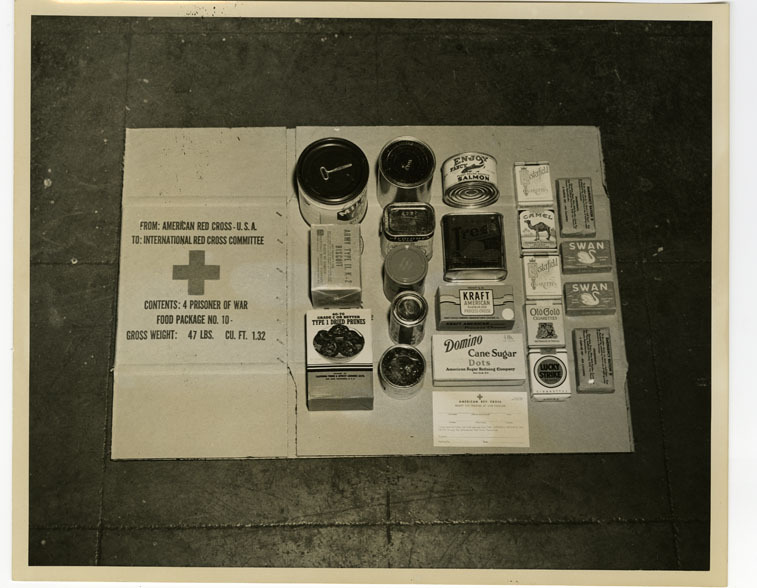 While this collection is not the be all and end all when it comes to the Red Cross’s WWII food packing service, it certainly serves as a very useful starting point for anyone who looking to research or learn more about it. 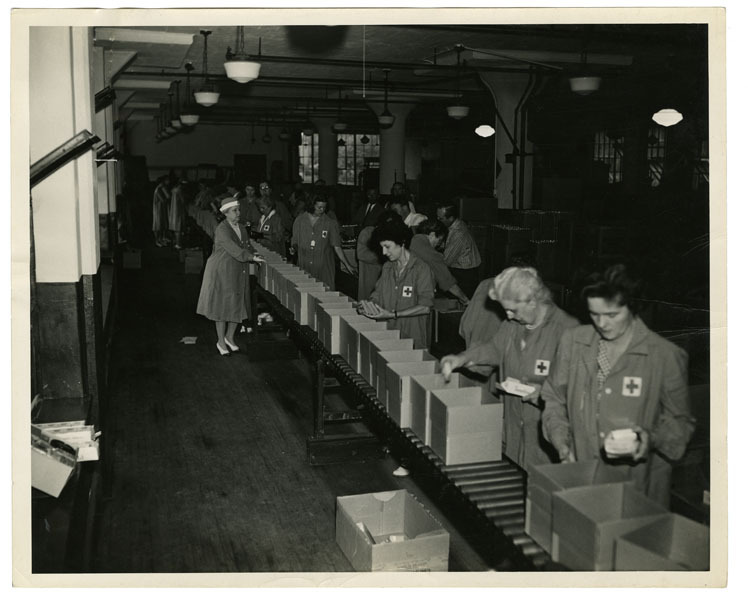 It covers a strict time period (1943-1945, with a few items dating from before 1940) but is rich in details concerning the outcome of Mrs. Lloyd’s work overseeing the American Red Cross’s first Allied prisoners of war food packing center in Philadelphia. 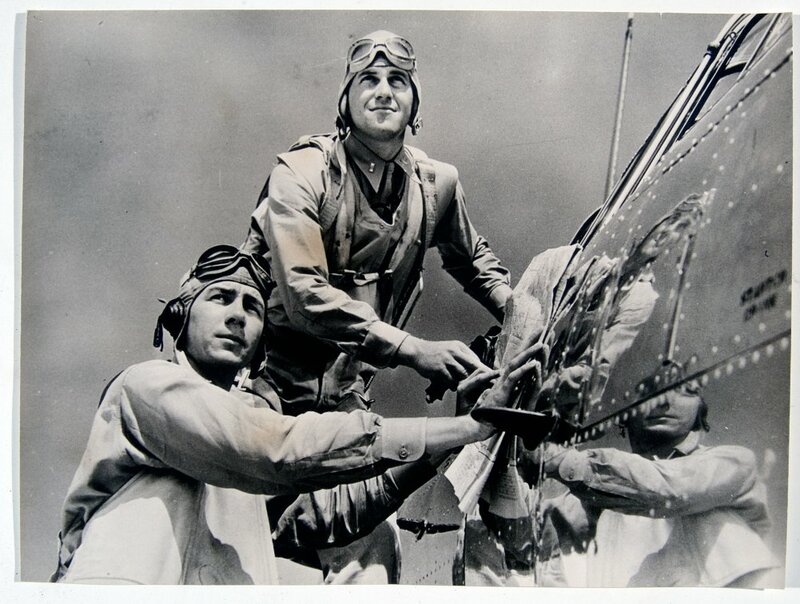 Granted, one won’t find out how Mrs. Lloyd became involved with the service, but one will discover the important role this service played in the lives of the servicemen who received the packages, as well as in the lives of the local packing volunteers. 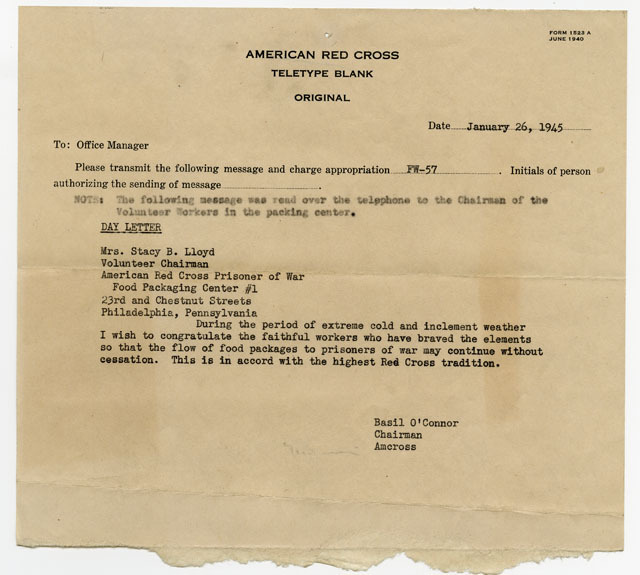 There’s one box of photographs highlighting the packing service (but there are also some of prisoners in camps) and one box of manuscripts that include clippings; correspondence; Mrs. Lloyd’s speech notes and radio transcripts; Red Cross forms, form letters, and brochures; and letters and receipts from prisoners. 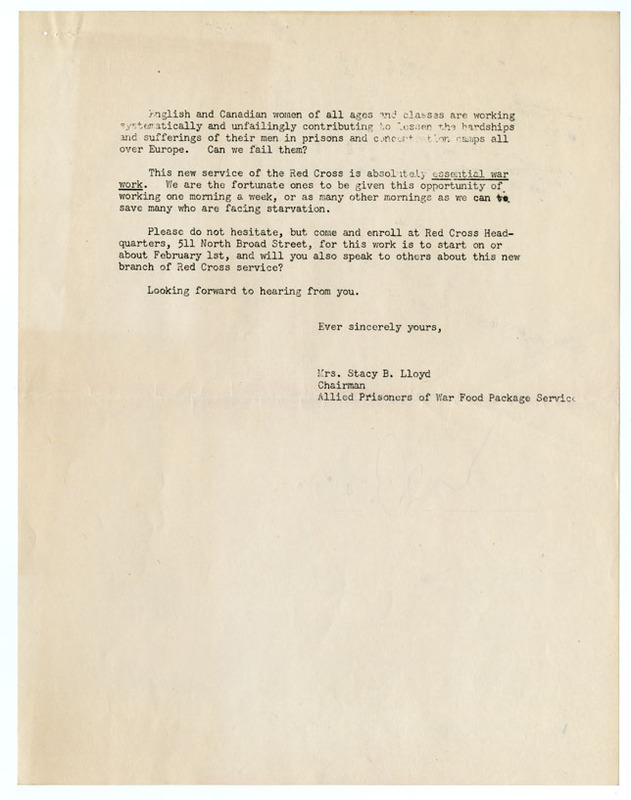 The finding aid for the Mrs. Stacy B. Lloyd papers on the American Red Cross’s Allied Prisoners of War Food Packing Service is now available online and in HSP’s library. 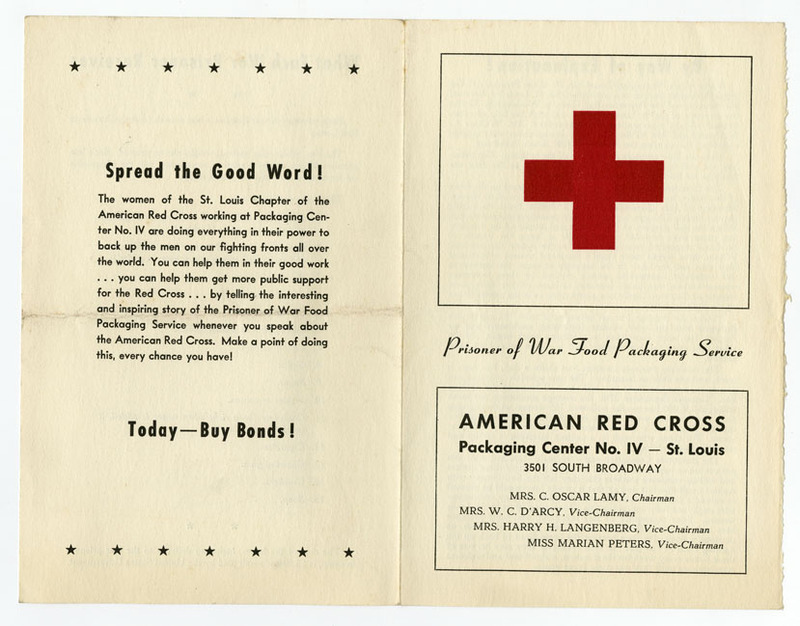 The American Red Cross also offers it’s own online museum that contains further information on its history and many services, including those provided during World War II.